I'm a sucker for new plants and to keep my garden fresh, always buy a few new plants each year, often not having any idea where I am going to put them when I bring them home. 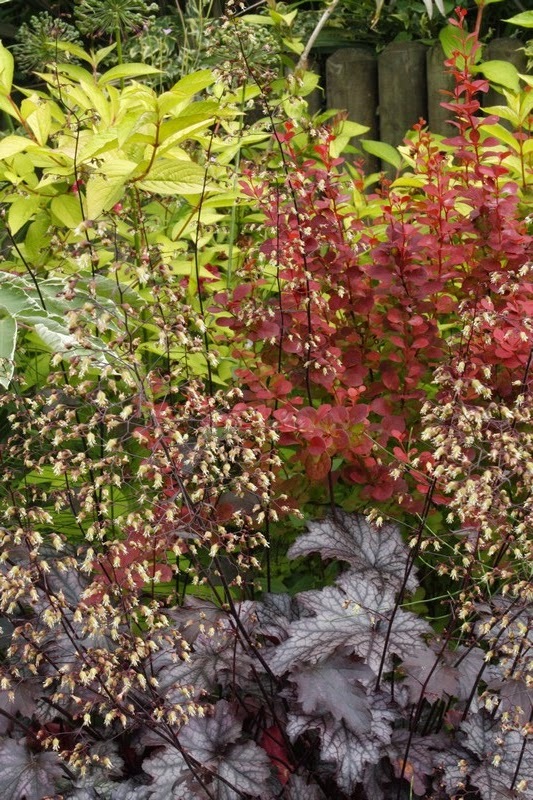 So a quick review of new and previously enjoyed (as they say in the jargon) plants. Firstly this year's new ones. 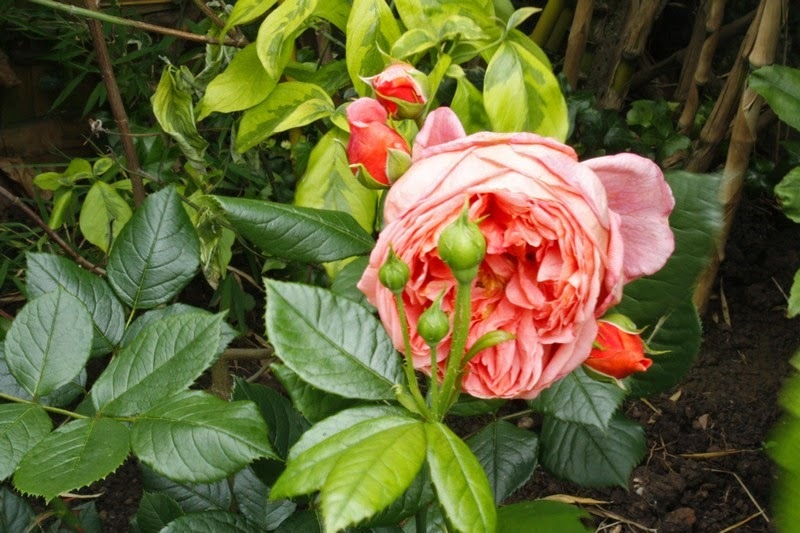 I have long been an admirer of the David Austin English roses and with my current need to fill my garden with permanent plants, I recently bought a bush of 'Summer Song' which has just given me its first blooms. As with all these roses, the blooms are lovely old blowsy roses but the colour is a little more salmon, rather than the orange that the label showed. As the first blooms opened, it rained and the weak nursery stems drooped but its is still a lovely plant and will I hope settle down and make some sturdy growth. 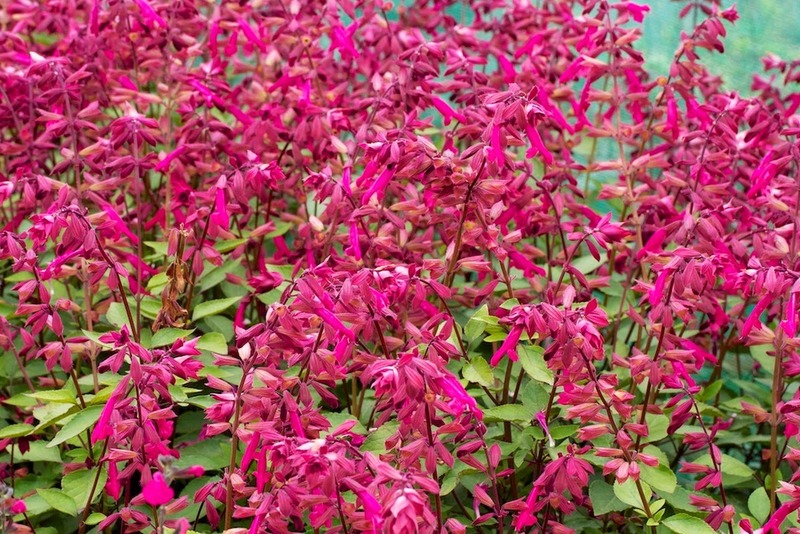 At the same time, I also bought a Salvia 'Wendy's Wish' which had lovely muted smoky mauve buds. 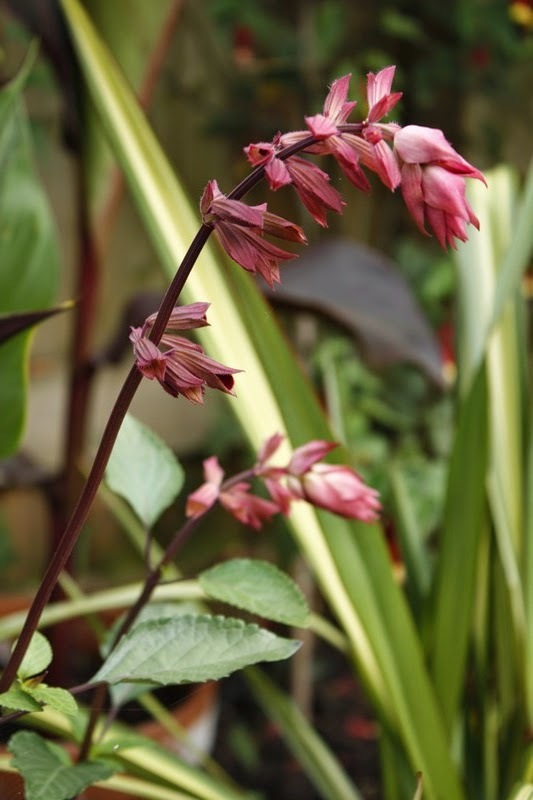 It has since opened to produce vivid cerise flowers, a bit brighter than expected but certainly colourful. If the mature plant is as floriferous as the promotional picture below, then it looks set to be a real cracker! Promtional picture in full bloom - wow! I also recently made an impulse purchase of an Olearia 'Moondance', a variegated form of the New Zealand native O. arborescens. 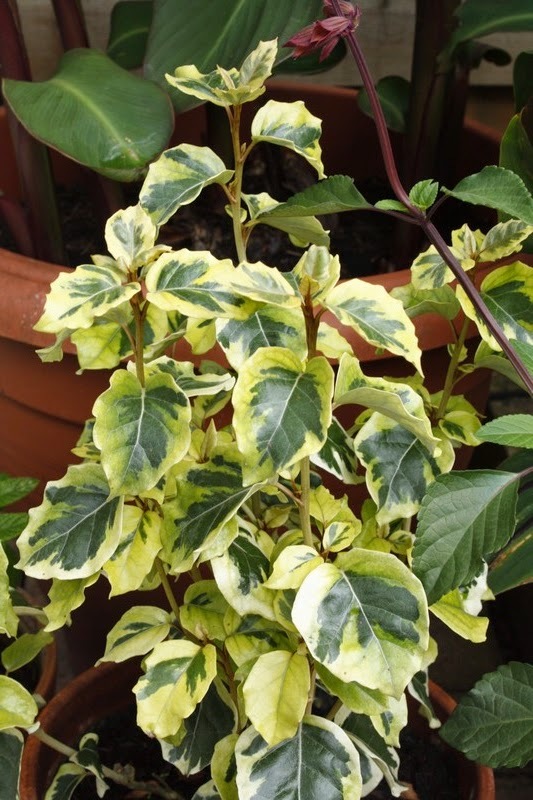 Apparently variegated plants do not sell well in New Zealand so it has not been introduced there. It is said to be hardy to -5C but time will tell! As yet I have no idea where I am going to plant this so am enjoying in a pot. Last year I purchased two small plants for specific spots in my front garden and both have settled in well. 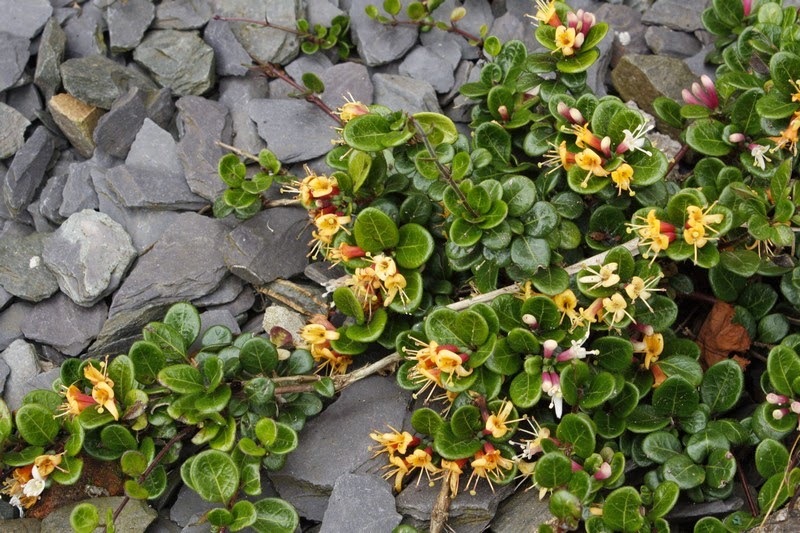 Lonicera 'Little Honey' has softened the corner between my front step and the rather ugly concrete path I share with my neighbour and is now flowering freely at less than 5cm tall. I recall from last year that it does have a scent, if you happened to be laying flat on the ground! 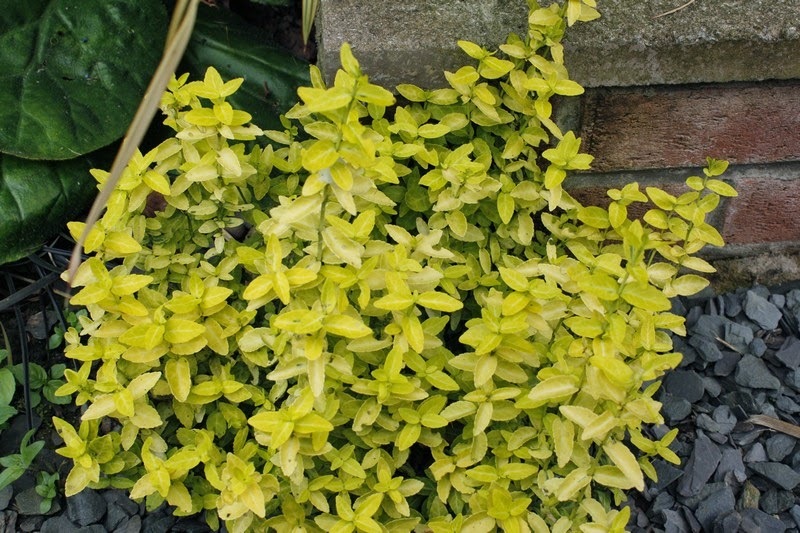 Nearby Euonymus 'Goldy has made a chunky little plant softening the other corner of the steps. 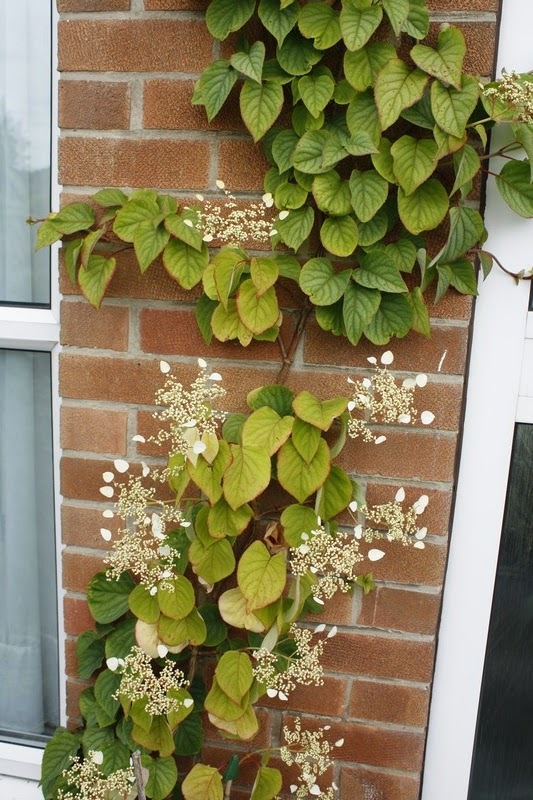 My Schizophragma 'Moonlight' planted a couple of years ago, is working its way nicely up the brickwork next to the front door and is just coming in to flower for the first time. Despite facing north, I think the spot is rather too dry for it, as the older leaves are yellowing - must remember to water! 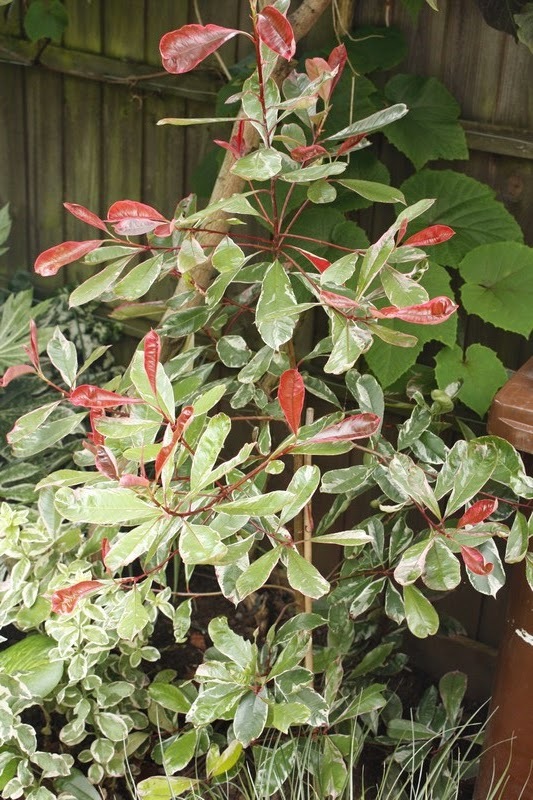 Last time I blogged on Photinia 'Pink Marble' I was a bit cautious (scathing?) and felt it had a bad habit with rather wayward branches. Since then, with a little judicious pruning and some sharp words, it has settled down and is now behaving nicely making a well shaped upright shrub. My older planting of Weigelia loymansii 'Aurea' with Berberis 'Orange Rocket' is well established, although still not quite as spectacular as the group I originally saw in a friend's garden. 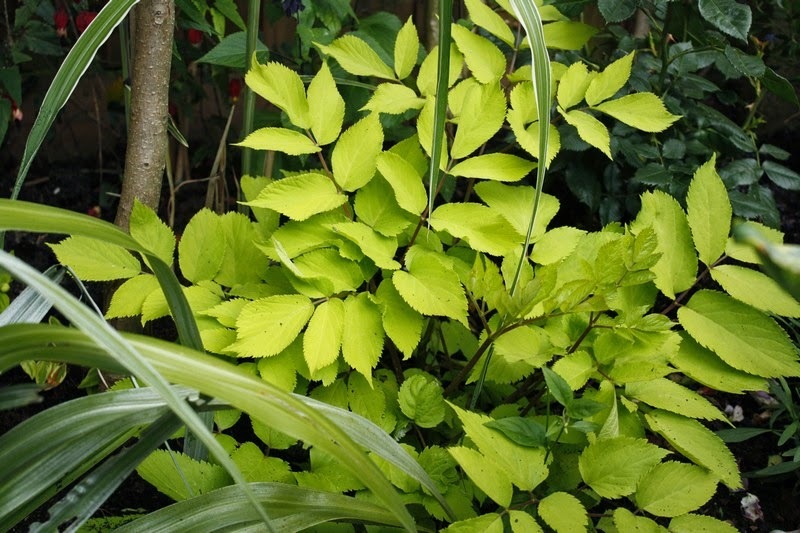 Aralia 'Sun King' planted last year has also established well with glowing limey green leaves. Occasionally fun things happen in gardens purely by chance and I haven't the heart to remove this lovely little ivy that has attached itself to my Trachycarpus. 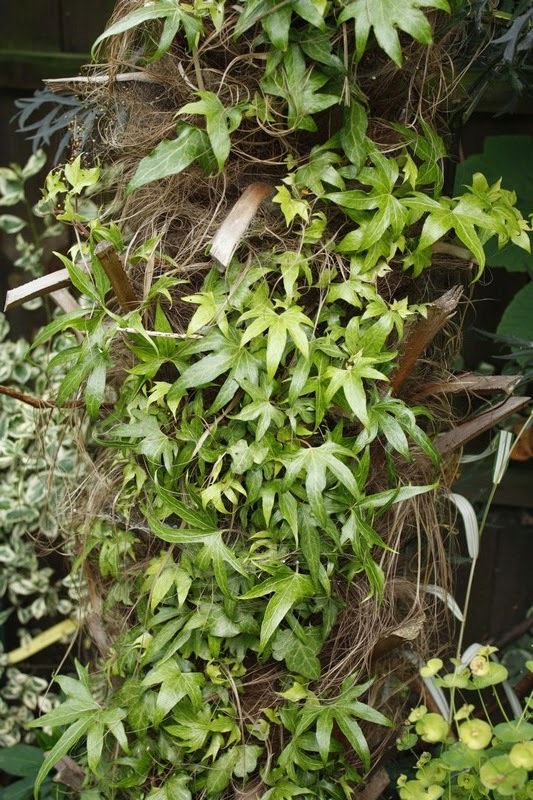 I know all the risks of ivy on any trees but will enjoy this mix, monitor and prune when needed. Long live serendipity! What a delight to see our UK garden doing so well. I love that rose even though, like you, I'm no fan. Of course, our yarden here in Palm Springs continues to thrive - and I do regularly check the irrigation as promised.